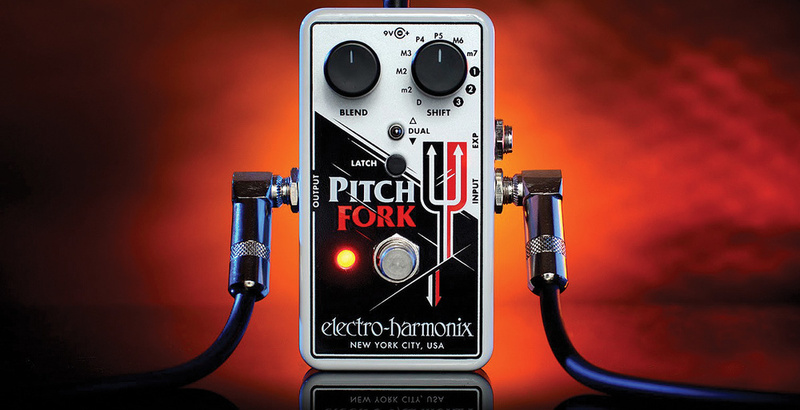 Electro-Harmonix have always had a good reputation for their pitch-shift effects. How does their latest one compare? The EHX Pitch Fork is an effects pedal based on the company’s well-established polyphonic pitch–shifting techniques, and is designed to shift the musical pitch of an instrument by up to three octaves up, down or in two directions at once. When the pedal is used in stand–alone mode, an 11–position rotary switch selects preset intervals while a three–way toggle switch selects pitch up, pitch down or dual mode. However, pitch–glide effects can also be created by connecting an expression pedal (or suitable control voltage) to the unit’s EXP jack socket. A further rotary control sets the balance of clean and effected sound. By default, the footswitch toggles between active and bypass in the usual way. But if the black Latch/Momentary button is pressed in, to engage Momentary mode, the effect only occurs when the footswitch is held down. Power comes from the included 9V PSU, though it can also be battery powered. The presets start with D (standing for Detune), which imposes a fixed shift of 17 cents — a little on the high side for subtlety, but it creates a nice chorus. All the others are whole intervals comprising Minor 2nd, Major 2nd, Major 3rd, Perfect 4th, Perfect 5th, Major 6th, Minor 7th, one Octave, two Octaves and three Octaves. In Dual mode, two pitch–shifted signals are generated. One is the same as with the switch in the up position, while the other creates a parallel harmony. For example, the major third up is accompanied by a perfect fifth up, the perfect fifth up by one octave down, one octave up by one octave down... and so on. In Latch mode, the external EXP input sweeps the pitch from unity to whatever interval is set on the rotary switch, creating the familiar glissando effect championed by DigiTech with their Whammy pedal. However, switch to Momentary mode and it’s unlikely you’d be able to operate both the pedal and the switch at the same time without falling over, so in this mode the EXP input adjusts the glissando rate, such that when the footswitch is pressed the pitch slides from unity to the interval set by the Shift knob. When the footswitch is released the pitch will sweep back to unity at the same rate where the pedal can set the glissando time from an almost instantaneous 4ms to a leisurely 2s. With nothing connected to the EXP input the default glissando rate is 60ms. Note that the EXP input is a TRS jack and the pedal should be wired tip–to–wiper, ideally being around 10kΩ linear. With no such pedal at my disposal during my tests, I wired up a 10kΩ linear pot to test the feature and found the pitch shift to be surprisingly smooth and even.